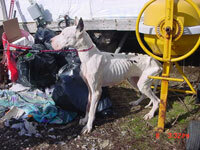 VALLEY TOWNSHIP (KDKA) — A woman is facing animal cruelty charges in Armstrong County. 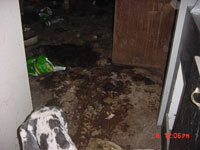 Humane Officer Penny Dewoehrel said feces and urine were everywhere when she accompanied State police to a home on Yockey Road in Valley Township. 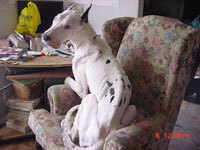 Nine Great Danes were found roaming in the house and one was chained to a wall. Three more were found dead outside. 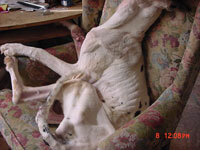 They apparently starved to death. For the complete article and video, visit KDKA. 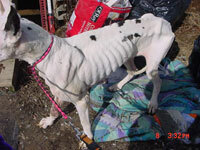 VALLEY TOWNSHIP, Pa. -- A woman who police said left a group of Great Danes to starve in a Kittanning-area home said Thursday that she is a good owner and treats her animals well. Barbara Grey is facing 12 misdemeanor counts of animal cruelty after several dogs were found malnourished and others were found dead last weekend inside a home that a Humane Society official described as "a total nightmare" in Valley Township, Armstrong County. For the complete article and video, visit WTAE. 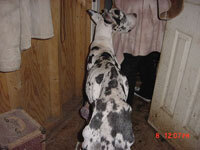 Slideshow of rescued danes at WTAE. Click here for a Youtube video from a newscast by WTAE. 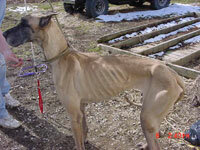 Charges were filed today against a Valley Township woman who is accused of abusing 12 Great Dane dogs in her Yockey Road home. 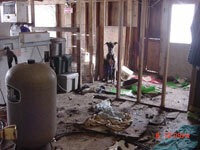 State police filed animal cruelty charges against Barbara L. Grey, 50. 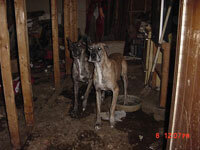 The dogs were found Tuesday by a humane officer who removed the them. 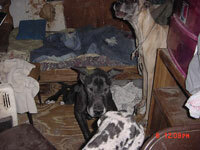 Three were dead and nine were placed in veterinary care. 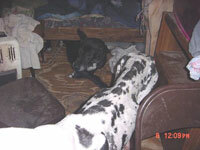 Police responded Saturday to a 911 hang up call at the Yockey Road home and saw the dogs inside and contacted the humane officer. 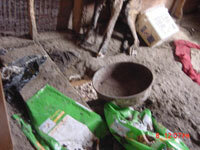 "We seized all of the animals and took the surviving ones to a local veterinarian," said Penny Dewoehrel, president, humane officer and cruelty investigator for All Animal Protection, Inc., of Parker, a nonprofit organization that protects animals from abuse and neglect. For the complete article, visit PittsburghLive. 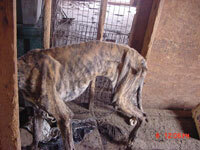 Below are pictures from the Humane Officer's camera.